Welcome to Vintage Junk in My Trunk, the 2015 version. I hope to have some new and improved features for you this year. And, as always, some fun junking adventures and fabulous finds! Maybe Etsy isn't even relevant anymore? Not sure if that's the case, but it's something to think about. Buying and selling via social media has really kicked into high gear. I have had some success on Facebook, and I know of many others who are doing well on Instagram. My plan right now is get back to blogging about our weekly thrifting, yard sale, and flea adventures. That kind of got lost in the shuffle last year; from June on I was only giving weekly updates on my Etsy Project listings. My goal is at least one blog post a week detailing our treasure hunts. During the busy yard sale season that may be broken up into two to encompass the weekend stuff and the fleas during the week. Mr. VJIMT and I spent the early morning of the first Saturday of 2015 at a local indoor flea market. I was having some mobility issues -- sciatica? some other old lady malady? -- so we didn't spend a lot of time, but it was fun to look. I came up empty, but he bought home this wood and glass-paneled terrarium. I may have to stick to shopping the Facebook sales for a while. I bought these cool wood church pew embellishments from my friend Cynthia at Artycyn Retroshop. This was trash-picked in the rain. It may be going back to the trash area. And that was how I spent the first week of 2015. Exciting, huh? Don't worry, it will get better. Spring is just around the corner… and with it, our yard sale season. Hope you stay with me for the rest of the ride! December has been a wild month so far! December 1 and 2 • Holiday Home Show (post and photos to come) -- this is why I've been behind in my blogging! Also, designed some new business cards for the Etsy Christmas shop. December 5, 3:30 am • Our next-door neighbor's garage blows up in the middle of the night. Fortunately, no injuries. Pretty scary, though. December 5, 10:00 am • Unexpected flea day, temperatures in the mid-60s (post and photos to come) -- wait until you see my treasures! December 6 • Young Mr. VJIMT turns 16! Here he is at two with the dear, departed Leo. I love both their little legs! December 8 • 1-2 inches of snow predicted. Real accumulation? 8-10 inches. December 9 • Snow Day for half the household. December 10 • It's snowing again, and winter is still eleven days away. Everybody's home. I've been on the fence about listing this weiner dog planter. So cute, and although I love dogs, I'm more of a cat person. Until I all-of-a-sudden realized it was a string holder! Keeping! Head over to Living Vintage for a big Christmas giveaway. Almost $800 in prizes from lots of vintage and handmade shops, including a $25 gift certificate to Vintage Junk in My Trunk! Lots of ways to enter, but hurry, contest ends Saturday. I'm always a little late for the party, but did you see the Easter eggs dyed with silk ties on Pinterest? My friend Keiren made these; they are so pretty and super easy to make. I didn't have any silk ties handy last weekend, but found these at Goodwill yesterday. So I'm way ahead of schedule now. Of course, I probably won't be able to find where I stashed these come next Easter, but at least I TRY to get ahead. Speaking of Pinterest, I'm really not sure yet about the whole pinning thing. I've gone on a bit to search for things, but haven't made many boards. At first, I was afraid it would be a giant time-sucker and I would be lost in a sea of pins for days on end. But in addition to making fun inspiration boards, it also seems like a good marketing tool. 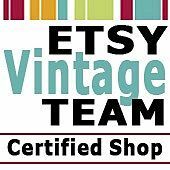 Mitzi of Flipping Vintage has written a great post on Using Pinterest in your Online Vintage Business. Then I started coming across some vintage bloggers who were having issues with Pinterest's Terms of Service, like this post by the talented Anne of Fiona and Twig. You can be held responsible if you pin something that you don't own and that person doesn't want to be pinned. Seems it would only be safe to pin your own items, which sort of goes against the whole concept of Pinterest. I think most people would want the free publicity and exposure, but I can certainly see how a photographer or other artist wouldn't want their creative property displayed without their permission or control. It's certainly something to think about, although the legal ramifications are a little too convoluted for me. Plus the Easter candy has been screaming at me and getting me all distracted. Damn you, Zitner Butter Krak Coconut Eggs. To read more about this issue, here are some links. My advice is to have lots of candy on hand. As for my decision? I would like to start pinning more, but I'll be sure to link back to the original post to give credit to the pin. In case you were wondering, you have my full permission to pin anything you like from my blog. And if you want to give me candy, that's ok too. An eye that has a corneal abrasion, that is. Actually two. I was finally able to open them yesterday, after two days of pain and swelling. I can sort of see out of them today, although the right one (the worse one) is still scratchy. It has a "contact bandaid" on it and I think it may have shifted. Don't ask me how I did it. Eye doc says it looks like a chemical injury. Maybe something got under my not-worn-very-often contact lenses? Hairspray? Basement dust mites? So bear with me. I hope to be back to blogging, and seeing, very soon. My “Year of the Dragon” fortune, hyphenated one-syllable word and all. Please help in any way you can. How nice to be noticed by a fellow vintage blogger! Susanne of zueeuz.blogspot.com honored me with a Stylish Blogger Award! I started writing this post weeks ago and then got sidetracked, so here it finally is. Thanks, Susanne, what a nice thing! 1. I am a dyed-in-the-wool baseball fanatic. My head is full of vintage baseball statistics. I have been to spring training. I count down the number of days left until opening day (22 as of today) -- which is always the symbolic first day of spring to me. I had vintage stadium seats in my apartment before I got married (the rest of my vintage baseball collection is packed away in the basement; I really should get that out. It's only been 15 years). My stadium seats looked like these, only green. The thing I most regret selling. 2. I originally went to college for Engineering. After a year of calculus and other mind-numbing courses, I ran screaming to art & design school. 3. Speaking of numbers, my birthday is 6/12, my son's is 12/6, and we were both born at 3:55pm. Additional note: I was pregnant (with my daughter) at my 40th birthday party. I do not recommend this. 4. I don't drink hot liquids. Not even coffee. My caffeine of choice is Pepsi. And no, it's not the same as coke. 5. I am allergic to turkey. I don't know why; I eat plenty of chicken, which is sort of related. So Thanksgiving is a little weird, but believe me, I have no problem finding something else to eat. 6. Also, the sun makes me sneeze and I can't HEAR without my glasses. Yes, I'm a mess. 7. William Shatner was my first celebrity crush. The vintage 1960s William Shatner as Captain James T. Kirk, not the 2011 William Shatner who appeared on American Pickers. You have to admit, he was a fine specimen back in the day. And his shirt matches my blog. You would be correct in assuming the rest of my brain is filled with useless Star Trek trivia, and that I am a geek at heart. Sooo hard to narrow down. There are so many vintage blogs with fabulous photos, pretty vignettes, chippy white stuff... absolutely drool-worthy! But these are the ones I look forward to reading the most. I enjoy the musings of these writers in addition to the yummy photos. Here are my selections (in alphabetical order). Maybe there will be a few that will be new to you. 52 Flea. Laura has the most gorgeous photos, posts almost every day, and makes even the tiniest, junkiest thing look amazing! Apron Thrift Girl. I recently found Salina's blog, and she has some great ideas, advice, and business sense. I've learned so much in just a short time. Fresh Vintage. Colleen is a total riot, finds lots of cool stuff, and has tons of technical information regarding blogs, Facebook, and anything web-oriented. Itsy Bits and Pieces. Linda is by far the sweetest, most encouraging blogger ever. And she's got cool stuff, and TWO Etsy stores. My Vintage Soul. This Linda is another vintage Christmas aficionado. Can't wait for the next Bouckville hook-up with my new-found New York pals. Oodles and Oodles. I really like the way Barbara writes -- very casual and funny. Plus she enjoys the occasional Shiny Brite. Shabby Vintage Junk. Tamarah, my Australian buddy, seems like a hoot! And she organized a whole vintage extravaganza on her own Down Under! Hope to meet her in person some day. Vintage Rescue Squad. Sue is the Gold Standard. I'm pretty sure this is the first vintage blog I found. Even more funny and irreverent in person! Vintage Sue. I'm amazed by this Sue's constant creativity while holding down the fort as mom to two little people. Her banner changes almost every week, she is always making tons of crafty things, and I really have no idea how she does it all. Thanks again to Susanne for the shout-out!